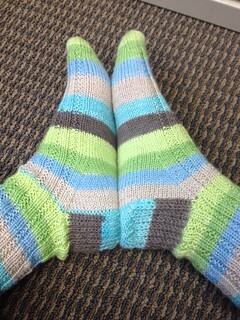 First Track Socks are done. I haven't decided whether to keep or gift them, so they are patiently waiting to warm someone feet. Then with the best of intentions I cast on Tablature by Romi Hill with Cascade Heritage, but after about 40 rows it just did not feel right. I think the color needs some depth. 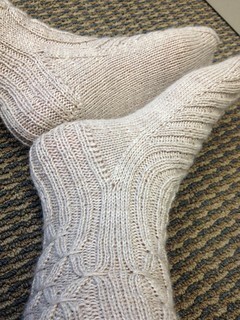 So the beige yarn has been turned into a comfy pair of socks using the Lord, What Fools pattern by Claire Ellen. Last year I finished stitching the stars for the 50 States Stitching Club by Wild Olive to their blue squares. 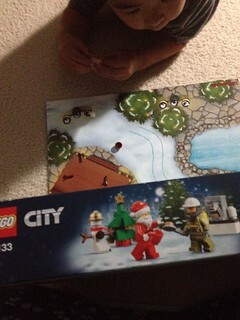 I cut the stripes for the remaining blocks. 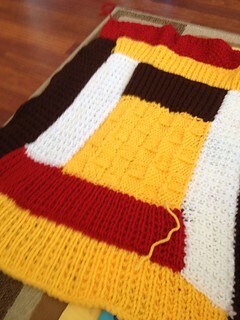 I changed the pattern slightly to have 3 rows of stripes rather than 4. Then the project sat waiting... and waiting... 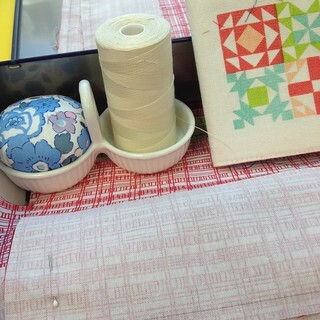 So I declared this to be my lunch project and will be hand sewing the rest of the quilt. 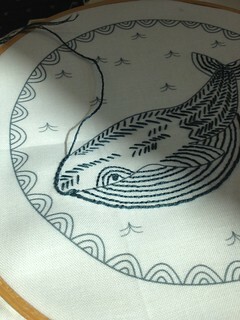 Piecing goes faster than I expect it to, but this project will be with me for awhile. Last year I joined the Cozy Blue Stitch Club. 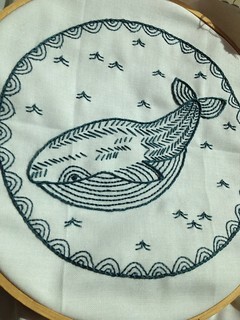 This lovely blue whale is the my first project in the club. 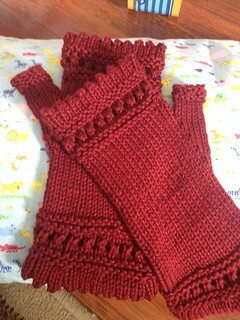 I managed to knit up another pair of Susie's Reading Mitts for a co-worker venturing in to the Northeast for the holidays. 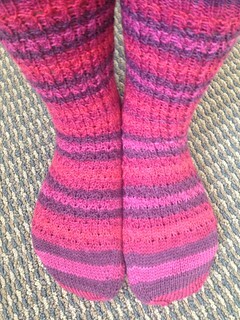 A few adjustment for the heavier weight yarn and these were a quick knit. I completed the Cornrow socks. 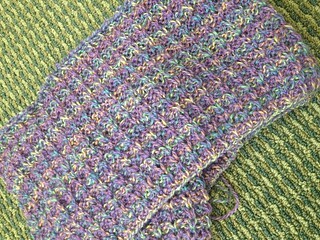 I added two rows of plain knitting between the twisted row to spread out the pattern. 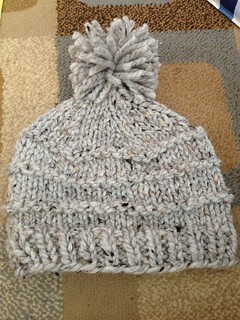 This one was on my needles for awhile, Just wasn't motivated to get them done. Then I cast on the Peace Project Cowl. 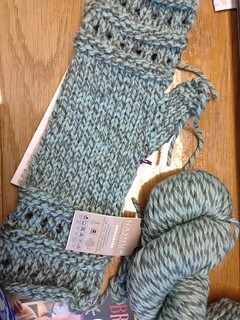 These 2 skeins of yarn has been sitting at my desk waiting for a pattern... I'm sending this cowl to my mom. The color is washed out in this photo, it is a deeper purple. 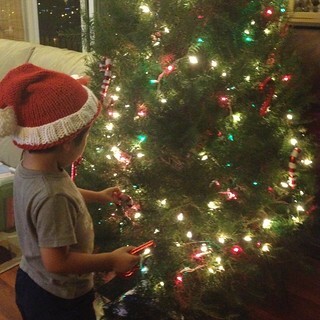 Then my helper elf got busy decorating our tree. Most ornaments were placed only as high as the elf could reach. Cozy Blue Stitch Club (November) and Blanket knitted in Knit Picks Brava Bulky. 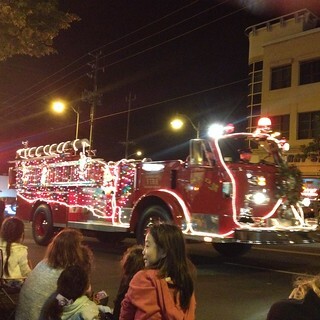 Hope you are enjoying a peaceful holiday season. 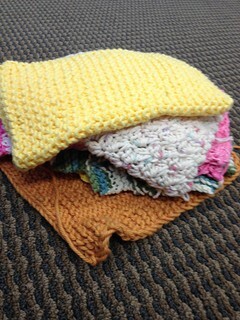 I like carrying around a quick project and dishcloths/washcloths fit the bill. What I don't like is weaving in ends. 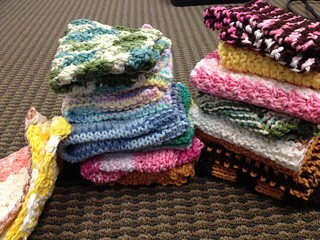 Here's part of the stack of cloths waiting to be finished... Can I procrastinate anymore? Just sit down and get to it! So I did... And I have an assortment of cloths for gift giving. Well, hello November! Did you see October just zoom by? I did manage to get some projects done. Her mom made her a scarf and gave me the leftovers to knit a hat. 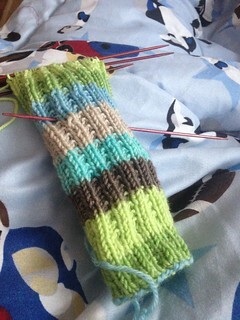 And there's a pair of socks on the needles...more info later. My stash consists of sock yarns and an odd assortment of one ball miscellany. So I was happy to find a project's worth of yarn, including the pattern, just sitting in my stash. 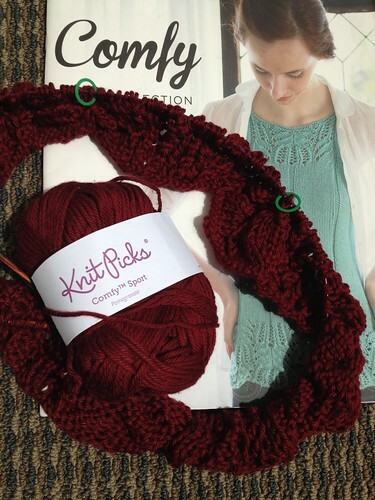 A free book offer in 2014 led to the purchase of the Knit Picks Comfy 2014 Collection and the yarn to knit Flora Opulence by Rosalyn Jung. 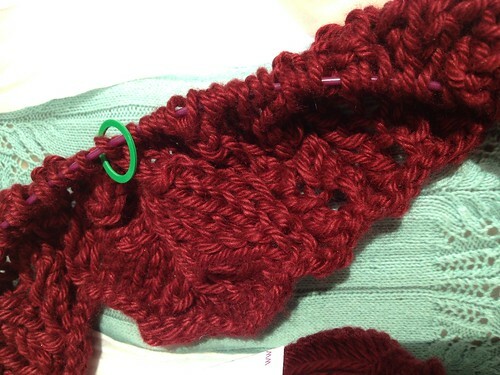 I'm using Knit Picks Comfy Sport in a lovely red called Pomegranate. I quickly cast on and made some progress. The lace section of this pattern has a 34 stitch repeat that I am having trouble memorizing, but it is only a short section before the wide rib starts. 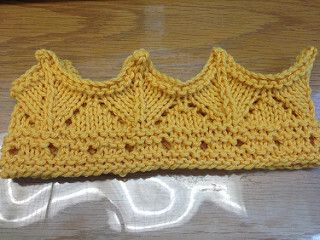 I hope to get past the lace quickly and onto some simple knitting. This is a Flickr badge showing public photos and videos from KarMyl. Make your own badge here.